Socialist Party member Dr Jackie Grunsell was elected a councillor for the Save Huddersfield NHS campaign in the May 2006 elections. Jackie received 2,176 votes, a majority of over 700, on a turnout of over 49%. She explains the success of the campaign. ABOUT 250 angry protesters hit Huddersfield's streets on 7 October, dismayed by the sham consultation that has taken place over local NHS cuts. We were also enraged by the announcement just the day before that Patricia Hewitt had backed her so-called 'independent' review, calling for consultant-led maternity services to be transferred to Halifax. The local paper declared it 'The End', but those on the demonstration didn't think so, nor did many other people in Huddersfield cheering on the demonstration as it passed. Indeed, many were disappointed in the local Labour MP, Barry Sheerman, who claimed to be 'shocked and saddened' by the decision, which he had initially backed until he realised it would cost the local Labour Party votes. The same goes for other local MPs who at best claimed the decision had been 'fair' and at worst celebrated it. The people of Huddersfield have seen the Save Huddersfield NHS campaign as one that will keep fighting for all the services locally, not just jump on and off the bandwagon when it suits their careers best. Many on the demonstration now see that the fight to save the NHS is a national one. Many have seen the fights breaking out across the country to stop cuts and closures and the recent struggle of NHS Logistics workers against privatisation, and are keen to attend and build for the national protest on 1 November. Socialist Students had a prominent contingent on the demonstration and had (alongside members of the campaign and Socialist Party members) been building for it in the week before, selling 39 copies of the socialist during that week and 48 on the demonstration day itself. "We’re voting for Jackie – she’s the only one we trust to fight for our services. All the others have promised us everything and delivered nothing". That’s what the people of Crosland Moor and Netherton promised us and that’s what they delivered with an 807-vote majority in one of the highest turnouts in the area. The campaign to Save Huddersfield NHS moved from the streets to the electoral plane with the election of Dr Jackie Grunsell last week. Regular readers will have charted the battle that is being fought to prevent the transfer of essential hospital services from Huddersfield to Halifax. The population of the town, for whom the implications are all too serious, has also closely followed this battle. On top of canvassing the whole ward, we held daily stalls outside the local shops and post offices which meant we were able to speak to a lot of people. Jackie’s number was on all the leaflets and people contacted us with offers of assistance and requests to meet and find out more about our views on other issues. The Liberal and Labour opposition tried to convince voters that there was no point in voting for a single-issue campaign. But it was clear that most people understood that the idea of defending our public services from the private profiteers is much more than a single issue. The foundation for Jackie’s election was built through hard work - months of organising demonstrations, lobbies and meetings. People were sick to the back teeth of official consultation meetings where everyone can let off steam, only to be ignored. By polling day, there were posters up on every street. On the eve of poll, the Lib Dems put out a ‘Red Scare’ leaflet, in a desperate attempt to put people off voting for us, but most people saw it as their attempt at a dirty trick. All Jackie’s election leaflets made it clear that she’s a socialist and people know that she is a determined fighter. In fact, some people thought it gave them even more reason to vote for her! So fraught were the Liberals and Labour with the thought of us taking what they saw as their seat that a fight broke out in the car park of one of the polling stations between the two parties! A young man on his way to vote for the first time came by and told us how he and his friends had been discussing it and they were all going to vote for us. They knew that pressure was being put on them to vote for the Asian candidates but were not interested. The NHS is a class issue and that is how the people of Crosland Moor and Netherton responded. Over the whole campaign loomed the desperate need for a new mass workers’ party, to represent and organise the angry and frustrated and those who do wish to get active to make a difference. This election result says enough is enough of the parties who represent the fat cats. It says we’re sick of the divisions in our communities that the main parties use to separate us. It says where a strong clear lead is given we will respond and fight to defend our public services. It says that we need a party that can unite NHS campaigns like this across the country and fight all attacks on the working class. The Save Huddersfield NHS campaign is dominating the local elections in Huddersfield. The local paper has featured the three candidates and in its editorial called the NHS the most important issue of the elections. Many voters in the Crosland Moor and Netherton ward are pledging their support for Socialist Party member Dr Jackie Grunsell who is standing for the campaign. Jackie has developed a high profile as the leader of the campaign and a local GP in the ward. It is almost impossible to knock on a door and find someone who hasn't heard about the attacks on local health services and the fight against them. Two public meetings in the ward have been attended by over 40 people, all with offers of leafleting and other help. Petitioning outside school gates has been met by clamouring for stickers and posters that seem to be appearing all over! The plan to transfer various hospital services to a PFI hospital in Halifax has caused outrage across the town. It is a credit to our work that in the last council meeting before the elections three hours was spent discussing the NHS issue, with all three main parties trying to claim to have done something in the campaign. The Tories called for the NHS Trust Board members to be sacked and for them to be publicly accountable! New Labour couldn't make up their minds. One councillor attacked our campaign, claiming it was a rabble and represented mob rule. However the Labour group's resolution condemning the Trust and calling for a referendum was passed. The Lib Dems also condemned the Trust but didn't mention that two of their councillors on the board had voted to close or transfer services. In reality, the whole council have sat on their hands during this crisis and are now desperately trying to get votes on the back of our campaign. But people in Huddersfield are not as daft as the councillors think. On our campaign stalls and on the doorstep we are discussing the future of the NHS and public services in general. This has given us a perfect platform around which we are presenting the argument for a fighting socialist alternative. There is a strong chance of a victory in this election although nothing is being taken for granted. The bandwagon is rolling with daily canvassing, a special translated leaflet for the 20% Urdu speaking population, and election returns showing overwhelming support for the campaign. Every street we leave has at least one poster displayed in the window calling for a vote for Jackie Grunsell. HUDDERSFIELD AND Calderdale Primary Care Trust have ignored local people's protests and voted for vicious cuts in the local health service. Only one or two trust members voted against the proposed moving and slashing of health services. But the people of Huddersfield, led by the Save Our NHS campaign group, are refusing to give up the services they have paid and worked all their lives for. The unelected, unaccountable trust board have no right to make a decision that affects the lives of thousands of people. Their combined salary - £6.2 million - would go some way to easing the NHS debt. The trust met on 22 March to vote on the proposals. They were greeted by around 40 members of the Save Our NHS campaign, who have organised three demonstrations over the last four months. Before long it was clear the meeting was a farce, a mere formality before they could officially announce the decision which had been made six months ago. The presentations were riddled with lies and even some hilarious truths - for example they showed that of the 742 individual letters they received, just eight supported the proposals! Yet the trust sat smugly as furious campaign members heckled. One young man even walked towards the supporters of the move shouting "shame!" at each one - before being dragged out by two of the seven bouncers employed for the meeting. The decision has not demoralised the campaign, which has collected well over 50,000 signatures. If anything the town seems more intent than ever to fight. Our next step is to stand candidates in the local elections in three wards. Socialist Party member Dr Jackie Grunsell will be standing in Crossland Moor and Netherton, calling for people to vote as if it were the referendum that the council refused to call. We also intend to lobby the health secretary and call for the government to overrule the trust's decision on the basis of overwhelming public opposition. 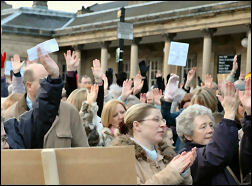 FOR THE second time in four weeks, the people of Huddersfield gathered on 14 January to oppose the Calderdale and Huddersfield Health Trust's plans to transfer hospital services out of the town. The plans include transferring gynaecology and children's wards, the special care baby unit, consultant-led maternity services and in-patient elective surgery to Halifax, whilst transferring emergency surgery the other way and closing a smaller local hospital. 30,000 signatures on petitions and floods of letters were handed into the Trust. Then the massive demonstration - of 1,500 local people - sent a message to the self-interested Trust bosses. 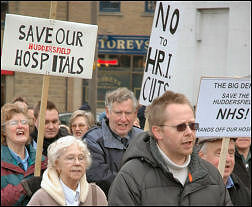 The protesters were determined that their services should not be ditched to prop-up the failing PFI hospital in Halifax. Indeed, one Conservative Party councillor blamed this privatisation of the health service for these cuts, a bit hypocritically since this was, and still is, Tory policy. Several councillors have attended this and the December demonstration to 'show their support' for the Save Our NHS campaign. However, Kirklees council still won't give the people of Huddersfield the right to decide themselves in a referendum, claiming they cannot afford it. However, the NHS trust can 'afford' these unelected bureaucrats to make their decisions against the democratic will of the people they affect. Mike Forster, a local trade unionist and Socialist Party member, told the crowd how, "If the money spent on the trust bosses' salaries was spent on the services, this would write off the Trust's current debt, fully fund all the services that are to be transferred and leave a surplus." Although the supposed consultation period is finishing, local GP and Socialist Party member Dr Jackie Grunsell told the crowds: "We can still make the Trust listen to the people of Huddersfield, because the final decision won't be made until March. Because the council refuse to hold a referendum, we will make the up-coming local elections a referendum on these proposals". Other Socialist Party members were also active on the demonstration, supporting the campaign's efforts and selling 57 copies of the socialist. "WE'LL MAKE you listen" shouted the front page of the Huddersfield Examiner as it reported on Saturday's 'Big Demo'. The two pages that followed told how the people of Huddersfield took to the streets on 10 December, in a 1,000-strong show of 'people power'. We were voicing our anger at the Huddersfield and Calderdale Trust's plan to axe hospital services in Huddersfield and to transfer a long list of others to the new PFI hospital in Halifax. It is clear that that the people of Huddersfield are prepared to fight long and hard to defend their health service. 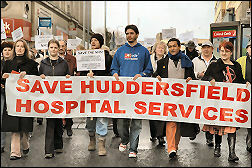 "Huddersfield Trust, hear us shout, hospitals in, directors out!" chanted the marchers on their way from Huddersfield Royal Infirmary into the town centre. People joined all along the route and came out of shops and houses to sign petitions, take leaflets and show support. The campaign, led by local GP and Socialist Party member Jackie Grunsell, has already collected 16,000 signatures on petitions against the proposals (12% of the population of Huddersfield). The so-called 'consultation meetings' charade held by the trust has only fuelled people's outrage. The local press quotes one protester: "This is the first time I have ever been on a march. I feel so strongly about this issue. This is about money, pure and simple and we will not accept it!" In her address to the rally in the town centre, Dr Grunsell made the point that there's enough money for Trust directors to award themselves salaries totalling over £6 million a year and that we could find a simple solution to the problem of the Trust's deficit! She also called on the trade unions to square up to New Labour's attacks by calling for strike action in defence of the National Health Service. "The tide is turning," she said: "People have made it quite clear they want their NHS left just as it is." The message from the people of Huddersfield was certainly loud and clear on Saturday. They want the council to hold a referendum on the Trust's proposals and they want the grossly over-paid, un-elected Trust fat cats to do as they're told by the people that pay their wages. They must keep vitally needed specialist services local, where they belong. There was a good turnout of Socialist Party members from the region and the party showed its high profile in the forefront of the campaign. If the Trust hoped for an easy ride, it was badly mistaken. It should be afraid when it meets on 21 December, very afraid! End privatisation. Bring all health care into one nationally planned and properly financed, publicly owned service, free at the point of use. Nationalise the pharmaceutical industry, the pharmacy chains and medical supply industry and integrate them into a democratically controlled NHS. Abandon the Private Finance Initiative (PFI). No more profiteering by building companies and banks. Fund new hospital building programmes with public money, using direct labour. A minimum of £8 an hour and a 35-hour week for all health workers. Reintegrate all health workers back into the NHS, with secure contracts, good working conditions and pensions. Fight all cuts in the NHS. No to redundancies. Unite the many "Defend the NHS" campaigns already in existence. 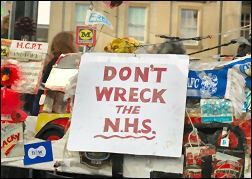 For a national demonstration to build support for industrial action. NETCARE, A private healthcare company from South Africa, has made huge profits from the NHS since the government told primary care trusts (PCTs) to put operations out to contract. Netcare landed a multi-million pound NHS contract to perform cataract and orthopaedic surgery. A recent Channel 4 News item showed that an above-average number of patients were left badly injured after the surgery. Pressure was put on doctors to operate when they shouldn't. Drugs were given to lower blood pressure before cataract surgery. There were serious failings in the way Netcare surgeons were recruited and vetted. Last year, units run by Netcare took over after thousands of cataract operations were privatised from Oxford Eye Hospital. South West Oxfordshire NHS PCT, which holds the area's NHS budget, wanted to "opt out" of using Netcare as the eye hospital could do the work just as quickly at less cost. A leaked Department of Health memo admitted that each Netcare cataract operation would cost £115 more than it does on the NHS, partly because the surgeons performing it are paid £500,000 a year. But the government said go ahead with the private deal. After six months of Netcare's contract, the PCT seems to have paid out £255,000 for £40,000 worth of work! Netcare charged for about 500 operations and assessments but only 93 were carried out. The government already says the NHS is 'overspending' by £620 million. An independent 'think tank' predicts that the government's market-driven health 'reforms' will increase the NHS's financial problems. The King's Fund study suggests that one in five NHS trusts will develop massive deficits as the reforms bite in earnest. Clearly Netcare and other privatisation schemes don't improve health nor do they save the NHS money! They're coining money out of our ill-health. Would you like to find out more about the Socialist Party? Why not Contact or Join the Socialist Party?